Ann Brimblecombe’s life was one well spent with almost 1000 mourners turning out to Wangaratta’s Holy Trinity Cathedral yesterday to bid the Victorian policewoman farewell. Killed in a car accident at Larsens Cutting near Eskdale, last Wednesday, Sen-Constable Brimblecombe was known about the North East for her work in schools as a bicycle education officer. The service, conducted with full police honours, reflected her jovial nature, her sense of community and voluntaryism and most of all, her strong relationship with the region’s children. Her older brother, Peter Brimblecombe spoke of her love for sport, the Geelong Football Club, her idol Gary Ablett and of the North East as her “spiritual home”. “After graduating from Chadstone College, she attended teachers’ college at Bendigo and after getting her degree there were no primary teaching jobs available,” he said. Mr Brimblecombe said his sister had eight nephews and nieces and remembered all their birthdays, was highly active in the Wangaratta bowls club, and taught adult literacy. “Her other great loves were dogs and chocolate,” he said. “She was old fashioned, quirky, bright and bubbly, she had a daggy sense of humour. The service was attended by Chief Commissioner of Victoria Police Christine Nixon and Victorian Police Minister Tim Holding. 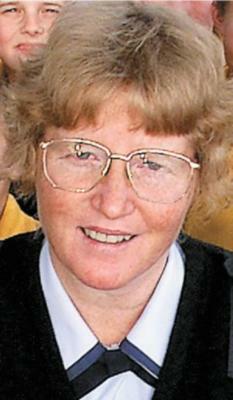 Most knew her as Senior Ann, and pupils of Wangaratta West, Chisholm St Primary, Wangaratta Primary, Cathedral College, St Monica’s Primary in Wodonga, St Patrick’s at Wangaratta, Moyhu Primary, Everton Primary, Wangaratta West, Yarrunga, Appin Park Primary and Bright P-12 College formed a guard of honour. Wangaratta Primary teacher David Capper paid tribute. “She had a terrific sense of humour, she used to make the kids do her Prince Philip walk and make them say ‘just like Senior Ann’ whenever she taught them anything,” he said. Beth Hutchinson, of Beechworth, said her daughter India-Rose, 11, taught by Senior Ann, had asked to attend the service. “She really got through to the kids, we were ever so grateful — she’s such a loss to the community,” Ms Hutchinson said. Police form honor guard at Senior Constable Ann Brimblecombe’s funeral. 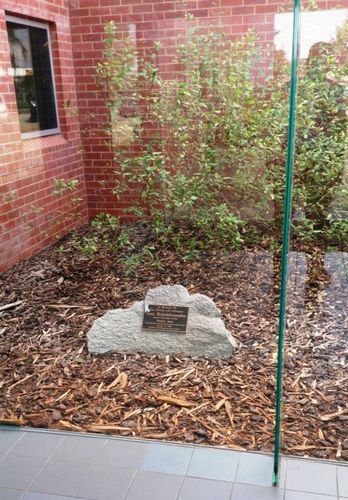 Commemorates Senior Constable Ann Brimblecombe placed in the Wangaratta Paediatric Unit. The memorial plaque was officially dedicated at Batchelor’s Green on the 10th May 2012. Senior Constable Brimblecombe was a Wangaratta Highway Patrol member who was killed in a car crash in August 2006 while travelling from Wangaratta to Mitta Mitta to give a bicycle safety lecture. She was affectionately known as “Senior Ann” by children as she ran bicycle education programs throughout the North East. A message about safety at your school or in the community could win your school $2,000 and also have them receive the Ann Brimblecombe Memorial Award. 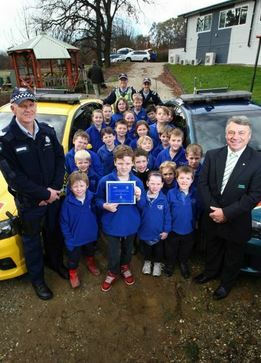 The ‘Caring About Regional Safety’ (CARS) program, which is now in its eighth year, is a primary school based competition that gets kids thinking about safety. CARS began as a way to both commemorate the valuable work that Senior Constable Ann Brimblecombe did with primary school children and also help ensure her messages about safety are ongoing. Tragically ‘Senior Ann’ as she was affectionately known by hundreds of school children, died as the result of a motor vehicle accident in August 2006. The competition is open to all local primary schools in NE Victoria and Southern New South Wales and asks children to actively think about safety and create a promotional poster. It could be safety at home, in the school yard or even when they are travelling. Teachers may like to encourage students to think about a safety message that they are individually interested in or have the class decide on a safety theme that everyone can concentrate on. Teachers should collate all their students’ posters (ensuring that each students name, class and school are written on the back) and send to the CARS Action Team before the competition closes each year. ‘Safety Sam’ is our mascot to help promote the ‘Safety- Think It .. Do It’ message. If the winning poster has the image of Safety Sam included in it, the students who created it will (pending parental approval) win a ride in a police car as well as a ride in a police boat. Download an image of Safety Sam here. Melbourne City & Canberra United will play for the Blue Ribbon Cup on Saturday in their second meeting of the 2016/17 Westfield W-League season. The Blue Ribbon Cup is held in partnership with the Victoria Police Blue Ribbon Foundation, which perpetuates the memory of members of the Victorian Police Force killed in the line of duty, by supporting worthwhile community projects within the State. This will be the first edition of the W-League Blue Ribbon Cup, with the player of the match to be awarded the Ann Brimblecombe Memorial Medal. Senior Constable Ann Brimblecombe passed away on duty in 2006 when her vehicle ran off the road while travelling from Wangaratta to Mitta Mitta. Senior Constable Brimblecombe was a serving member of the Victorian Police Force for over 26 years, and was promoted to Senior Constable in 1985 after six years in the force. 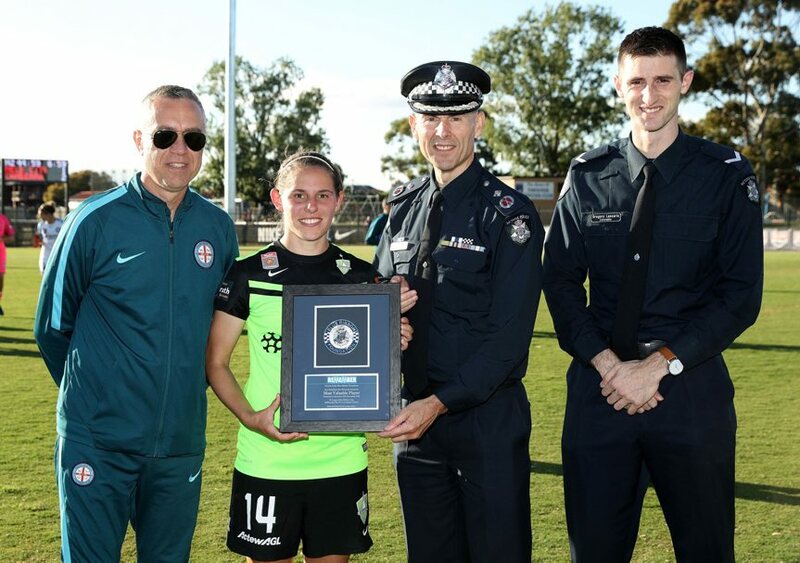 Canberra United Head Coach Rae Dower, a former member of the Queensland Police Force for over 20 years, said that the occasion adds something of a personal feel to the matchday. “It’s a lovely initiative from Melbourne City, the Blue Ribbon Cup, played for between the two teams,” she said. 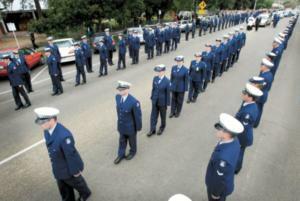 More information on the Blue Ribbon Foundation can be found at http://www.remember.org.au/, including information on the projects managed by the organisation, and an honour roll of those who have served. To those involved in keeping ‘Senior Ann’s’ work and memory alive for ten years. Thank you with pride and gratitude from her family. 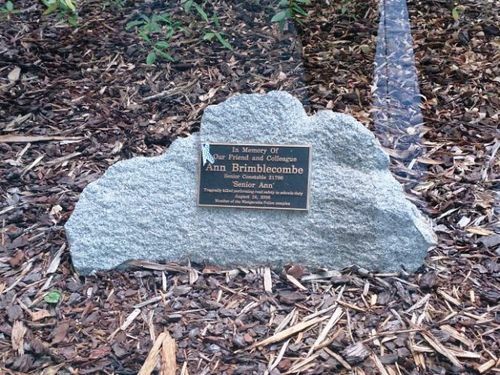 TWO rosemary bushes will be planted next to an existing commemorative plaque for Senior Constable Ann Brimblecombe. 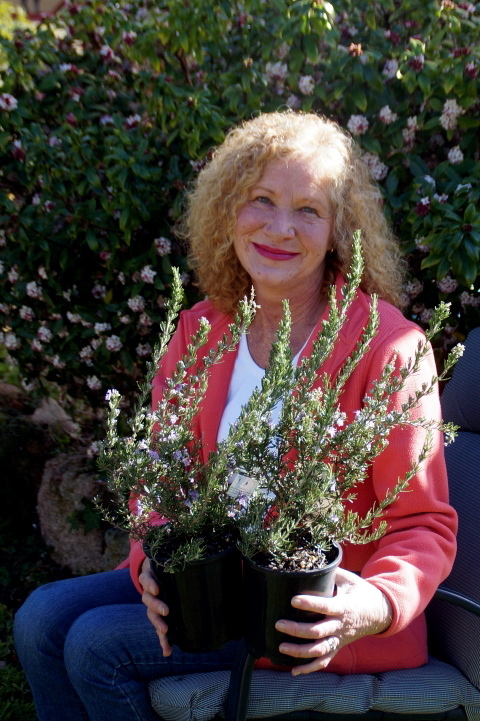 The plants will be installed at Wangaratta Police station by Ann’s sister, Claire Lewis, on Tuesday on the 10th anniversary of Ann’s death. 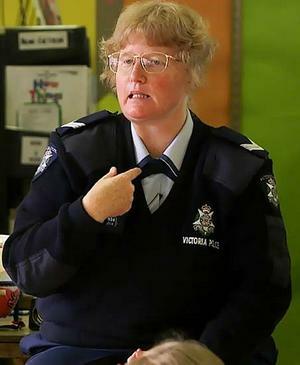 The former Wangaratta police officer, affectionately known as ‘Senior Ann’, was tragically killed in a car accident at age 49 in 2006, on her way from Wangaratta to Mitta Mitta to present a bike safety session. Rod Johns I attended and took charge at this collision a very sad day and one I reflect on often, a lovely lady who put so much energy into the children at the schools she attended. A great community loss and to her family. Nicole Shortis I was a member at the Wangaratta bowls club with Anne and her family when this tragedy happened. It was nice to see her face come up on Facebook. Great to see such a good project come from a sad tragedy. Tahn Lawler I remember Senior Ann being at my school in Chiltern. The Prince Phillip Walk definitely confirms it. Tara Emily Prince Philip walk! Gillian O’Hara R.I.P. Sorry to hear this news. Pam O’Sullivan RIP Ann. I hope those school kids get the message you were on your way to deliver. You’ve shown by example how quickly and without warning death can take the life of a road user. My condolences to your family and colleagues.. Address: Wangaratta Police Complex. 21 Handley Street, Wangaratta Police Complex, Wangaratta, Victoria. A COMPETITION designed to give children safety awareness is teaching Victoria Police a thing or two, too. This year’s Ann Brimblecombe Memorial Award was launched yesterday at Wooragee Primary School, the winner of last year’s safety awareness competition. 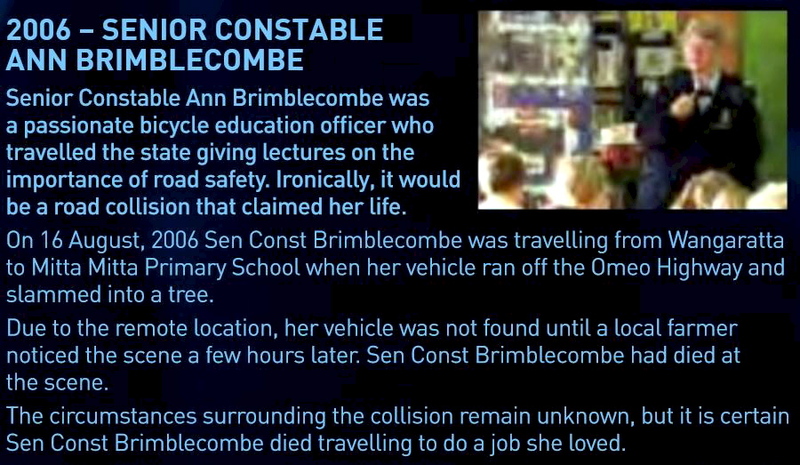 The award, in its 7th year, commemorates Sen-Constable Ann Brimblecombe, the North East’s road safety in schools officer, killed in a car accident in 2006. She was the state’s only such officer and there hasn’t been another in the North East since. Her memory lives on through this competition, which involves North East and Albury pupils creating posters with safety messages. Sgt Michael Connors, of Wangaratta highway patrol, encouraged children to talk about all aspects of safety. He said their observations gave police greater insights and were often “completely different to what the police are thinking”. “I can’t stress enough how important that is. You couldn’t gauge how many kids have been saved by Ann Brimblecombe’s message,” he said. Wooragee’s winning entry focused on stranger danger. Other themes were cyber-bullying, kitchen safety and phoning while driving. The winning school receives $2000 from WAW Credit Union. Wooragee Primary School principal Christine Varker said the children were already brain-storming ideas. The school will spend its prize money on building a chicken coop. “They’ve even considered the safety of the chickens,” Ms Varker said. 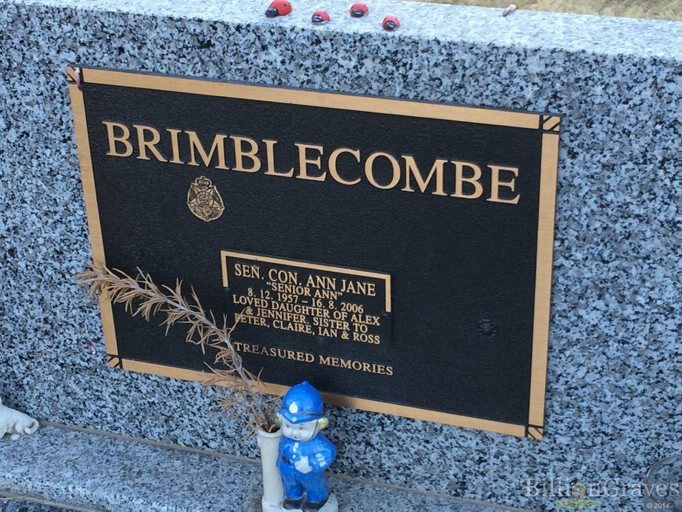 THERE couldn’t be a more appropriate way of paying tribute to Sen-Constable Ann Brimblecombe than what was unveiled yesterday. The Wangaratta police officer died in 2006 while on duty after her car veered off the road when travelling to Mitta to give school children a bicycle safety lecture. Children’s safety was close to her heart and it’s because of her that the Wangaratta Hospital’s paediatric unit has now become a safer place. In tribute to Sen-Constable Brimblecombe, the unit received a $30,000 donation from the police Blue Ribbon Foundation for security doors and a refurbishment to their baby room. Jennifer Brimblecombe said her daughter didn’t like a fuss being made over her. “She’d be thrilled to bits for the honour but she was just very happy doing her work, hoping it would stick with all the children as they grew up,” she said. Sen-Constable Brimblecombe’s passion for educating stemmed from her original ambition to become a schoolteacher. “She actually couldn’t get a job when she finished a teaching course. She tried very hard for a while then the next thing we knew she applied for the police force,” Mrs Brimblecombe said. Soon after she was offered a position to teach, but instead chose the police force. “She was a very dedicated girl. When she decided she wanted to do something that was her focus completely,” Mrs Brimblecombe said. Unveiling the plaques to commemorate the memorial was one of the last tasks for deputy police commissioner Kieran Walshe, who will retire after 44 years of service on July 1. He said the Victorian police force was often described as having “a ringside seat at the greatest show on earth” but it still had its lows. “When you are in a position of authority and leadership and you hear of these things, like what happened to Ann Brimblecombe and others, they’re lowlights in the organisation,” he said. Funding for the urgent care unit at Benalla Hospital was also revealed in memory of Sen-Constable Simon De Winne, who died in 1998 after colliding with a tree while trying to pull a car over for a traffic offence. The Wangaratta community joined forces to honour one of their most beloved police officers and continue her dedication to road safety with the launch of the Ann Brimblecombe Memorial Award today at Yarrunga Primary School. Senior Constable Ann Brimblecombe was Victoria’s only dedicated Road Safety in Schools officer, making her “truly one of a kind” according to her colleagues. 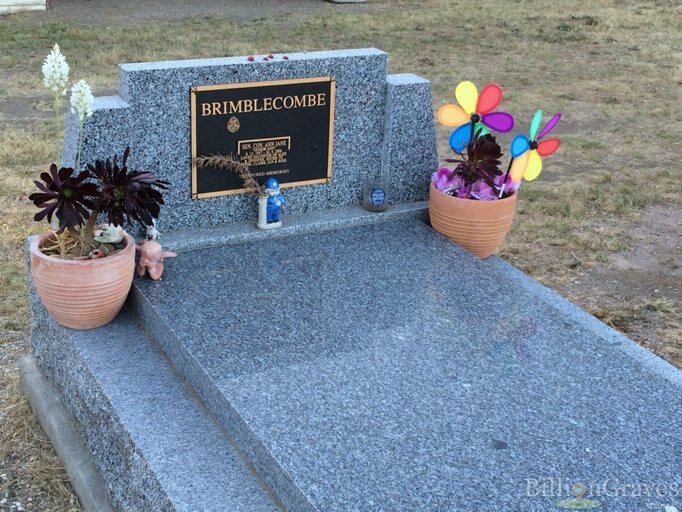 Tragically, S/C Brimblecombe was killed in a vehicle collision in August 2006 on her way to Mitta Mitta Primary School. Assistant Commissioner (Region 4) Bob Hastings said the award was a fitting tribute to S/C Brimblecombe. “One of Ann’s strengths was her commitment to road safety and the impact she had on hundreds of young lives in the area,” A/C Hastings said. “I’m very proud to launch the Ann Brimblecombe Memorial Award and I strongly believe it will continue her work in road safety. 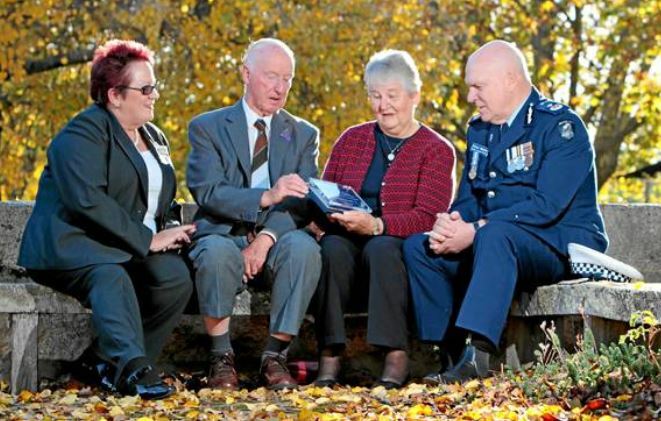 The award was the idea of a number of Wangaratta police members after Region 4 Division 5 Superintendent Jock Menzel suggested they look at a way of honouring S/C Brimblecombe’s memory. It invites schools to ‘Care About Road Safety’ (CARS) by identifying a road safety issue and developing an action plan to combat it. The school that submits the entry judged to deliver the most benefit to their school community will also receive $2000 from WAW Credit Union. A/C Hastings spoke at today’s launch about the impact S/C Brimblecombe had on the community. “Ann had her own way of passing on the road safety message, trying to make it as fun as possible and as a result her messages would be remembered,” A/C Hastings said. “There would be many occasions where Ann would purchase small toys or action figures on her own initiative, in an effort to show kids a message she was trying to get across, such as toy rollerblades and the correct way to lace them up. A/C Hastings also reflected on S/C Brimblecombe’s generous nature and her ability to make everyone feel special. “Ann was awarded prize money at one point by the Wangaratta Council Youth Representatives and approached Senior Sergeant Bill Gore to check she was allowed to keep it, then spent it on prizes for the kids at schools,” he said. “She had a way of making sure nobody missed out and when there were kids who maybe needed a helmet for riding their bike to school but perhaps couldn’t afford it, Ann always made sure they had the right equipment. In an effort to promote road safety, WAW Credit Union has also lent their support to the award. “As part of our Community Support policy, WAW Credit Union actively looks for ways to support worthwhile projects in the areas our service centres operate,” said WAW spokesperson Linda Butler. “The work S/C Ann Brimblecombe did within our region’s schools was invaluable and so we were very excited to be asked to be part of the Caring About Road Safety initiative. A/C Hastings urged all students to think about how they could best make a positive impact on their school. “This competition is about the school community so think about the ways you can improve road safety around it,” he said. “A safer bus shelter, a fence around your school crossing to ensure children don’t spill out on to the roadway, road signs, anything else that you can think of that will make your school safer – put it together in a submission and send it in. THICK fog is believed to have caused a single-vehicle crash that killed a country policewoman dedicated to teaching children about road safety. Senior Constable Ann Brimblecombe, 49, was on duty and travelling from Wangaratta to Mitta Mitta yesterday when her vehicle ran off the Omeo Highway about 2½ kilometres south of Eskdale and struck a tree. Senior Constable Brimblecombe, a bicycle education officer, was on her way to give a lecture at the time. Police believe she left Wangaratta at 7.30am and at some stage her car left the road in foggy conditions. It was discovered by a farmer about 11am. She had been a police officer for 27 years and had worked at force reserve in Russell Street before being stationed at Kew. In 1981 she was stationed at the Russell Street policewomen’s division and also served in the community police squad in Melbourne’s east. She was promoted to senior constable in 1985 and while she returned to force reserve in 1993, she transferred to Wangaratta in 1995 where she had worked ever since. Yackandandah Primary School, where Senior Constable Brimblecombe had spent the two days before her death teaching road safety, was in shock after learning of the tragedy. Principal Kathy Petzke said the pupils looked forward to Senior Constable Brimblecombe’s annual visit. Wangaratta police acting Inspector David Ryan said her death was a great loss not only to Victoria Police, but also to the general school community. Assistant Commissioner Bob Hastings said Senior Constable Brimblecombe regularly travelled long distances as part of her job. “She was always a very cautious and safe driver … she was well prepared and knew the country and the terrain,” he said. Police Association secretary Paul Mullett said Senior Constable Brimblecombe was a well-respected member who would be sadly missed.